Wedding season is upon us. It is that time of year to dust off your hat and dig out your finest dress (or, if you are like me, frantically find a new one at the last minute). It also means finding the perfect wedding gift for the happy couple, which is both meaningful and practical. To help you choose a unique wedding present for your loved ones I have put together the top 5 gift ideas from our collection. With their eye-catching animal designs, these gifts are sure to bring happiness to every couple. 1. His n’ Her / Her n’ Her / His n’ His Aprons! Choose two animal aprons and match them to the couple’s personalities. From the Noble Stag to the Chirpy Sparrow, there is something to suit everyone. Use our ‘What animal are you?’ page to find out which animal they are to discover which apron is for them! Choose one of our fabulous Great British animals and buy the gift-set. In particular we love the Dynamic Dragonfly Gift, which includes 2x mugs, 1x tea towel, 1x apron, 1x tote bag, 1x single oven mitt, 1x magnetic to-do list pad, 1x pack of 2 A5 notepads, 1x pack of 10 coasters, 1x pack of 10 note cards, and 1x greetings card. Our gift sets are great for giving as a ‘new home’ gift as well as it is almost like a mini-starter pack – it has all the essentials, apron, dish towel, mug and shopper bag – if you want to make it EXTRA special then pop in a bottle of prosecco, or 2! Pick an animal they will love and buy 2 mugs and their matching coasters. A gift that is sure to make them smile everyday when they have their morning brew. Help the happy couple organise the start of their married life with a selection of our animal themed stationery. Choose from our popular weekly planners, notebooks and note cards – ideal for leaving little ‘I Love You’ notes around the house. Our weekly planners are perfect for using in the kitchen as meal planners and you can pair them up with the matching magnetic shopping list as well! Looking to get the Groom, Best Man or Father of the Bride a gift to be used on the BIG day itself? Our wedding speech cards are a thoughtful gift that will help prepare them for their speech. Each pack contains 10 postcard sized note cards with a striking stag (very appropriate we think!) design printed on each one. 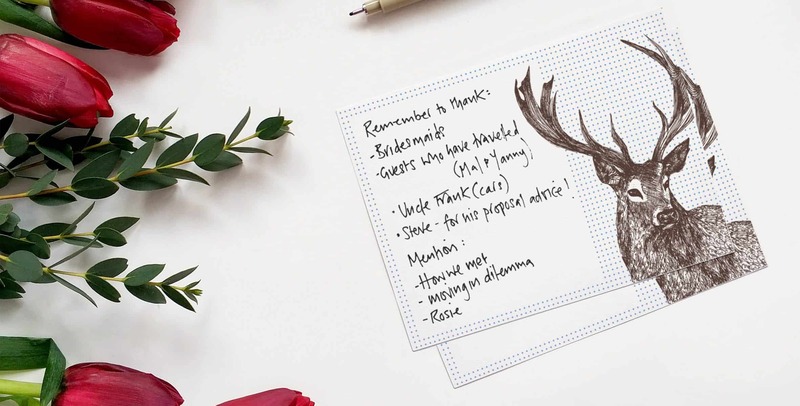 There is enough space to the left of the card for the the speech giver to jot down the all-important points to remember. It will also look neat and tidy with no horrible bits of crumpled paper to spoil any wedding shots the photographer captures of the Best Man, Father of the Bride or Groom giving their speech! You can view the rest of our cards here. Have a happy wedding season everyone!